OK… it was technically a hill, but today it definitely felt like I was climbing a mountain. 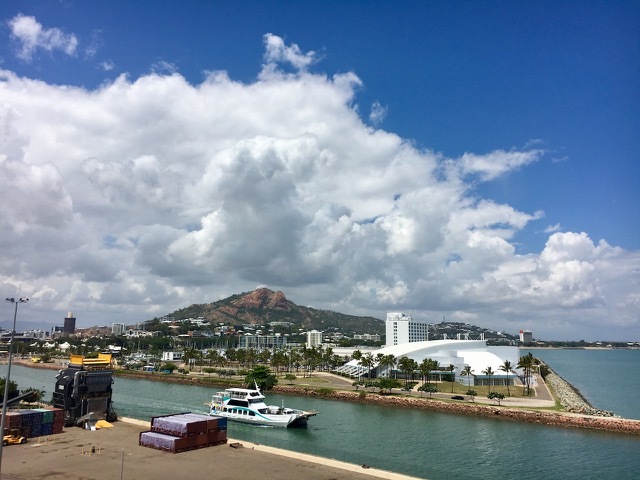 When you approach Townsville from the sea, all views are dominated by huge monolith of orangey-pink granite rock behind the town called Castle Hill. At 290 metres tall, it's only just a few metres short of being classified a mountain, and when you're struggling half way up it, the name "hill" doesn't seem to do justice to this forbiddingly tall and steep lump of rock. For the energetic, it's a Townsville ritual to climb the hill every morning, so seeing as we're on a bit of a fitness drive at the moment, we decided to give it a go too. The main problem is that Townsville can get incredibly hot, so we wanted to get going as early as possible in the morning (we were cleared at about 7.45am), and the Shuttle into town only started at 9am. That meant that we were adding to our fitness challenge by having to walk to the start of the hill too. So, we asked a couple of people at the terminal how long it would take, with estimates ranging from an hour and a half, to two hours (which seeing as we only had just over four hours here would leave it a bit tight). That meant that we started with a speed walk to the start of the trail. We were already sweating by then, but that was nothing compared to the buckets of perspiration pouring off us as we sweated our way up the steep side of the hill/mountain. Fortunately, the path has just been re-opened after fixing up its steps, which meant that we didn't have to worry about losing our footing. 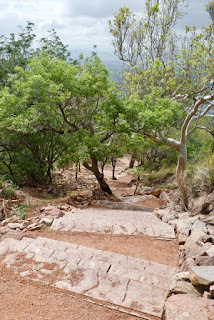 The sign said that there were 1,100 steps up to the top, and progress initially didn't seem like it was very fast – every time you turned a corner, another seemingly endless set of steps stretched up ahead of us. Our calves and thighs were beginning to protest quite loudly, but suddenly the end was in sight, and as we approached the road toward the end of the trail, we saw loads of unbelievably fit-looking people walking, jogging, and pushing prams with scarcely a bother. By now, we were fairly dishevelled and caked in sweat, yet as they jogged past us somehow they were looking fresh as daisies. 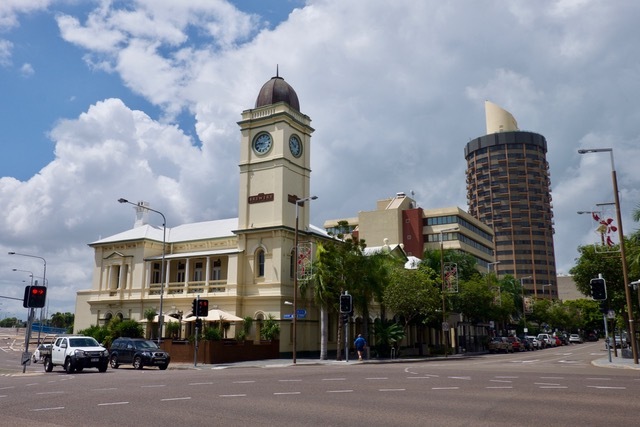 Townsville must have a pretty fit population. 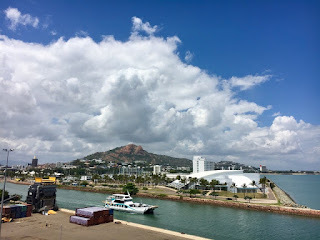 But, it was great to get to the top (it had taken about an hour from the ship), to enjoy the views of the flat town ahead of us, and to get some cooling breezes blowing up the hill. 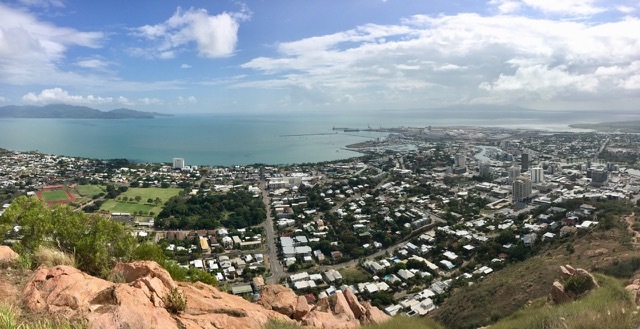 On the other side of the hill, the rest if Townsville sprawled into the distance, with the Hervey Mountain range beyond. Predictably, coming down was much easier and quicker, but we were by now not fit for much beyond a little bit of wandering, and general moaning about how tired we were. How all those people who were running up and down the hill then did anything else during the rest of the day, I don't know. Some days you don't need to achieve much more than climbing every mountain (or hill).